This entry was posted in craft, IF history, interactive fiction by Emily Short. Bookmark the permalink. Sad. Where are the games that make you actually get out a piece of paper and draw a map? That’s really subjective, since “drawing a map” can mean many different things. In Varicella the map is almost a tactical planbook, while in an explorer-type game like Treasures of a Slaver’s Kingdom it serves more navigational purposes. Some games like Delightful Wallpaper might make a literal puzzle out of the map, and in long but easily-navigatable games like Spiritwrak a map helps to keep track of all the available puzzles at any given time. 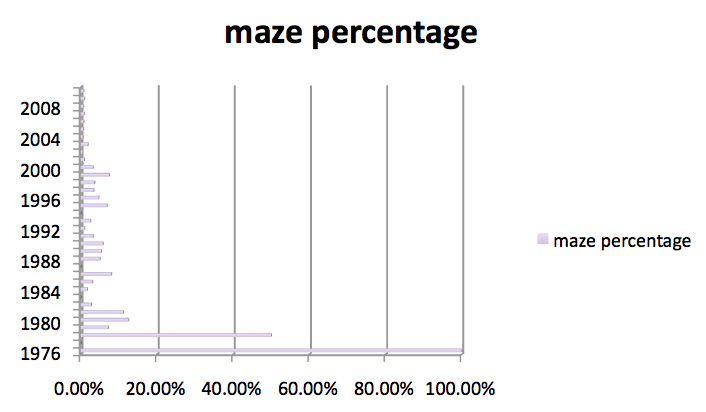 Not to mention that a reasonable number of mazes require not maps, but spreadsheets. There was one that stuck with me where every room had the same name/description and had 10 exits, and every exit was only one way. Map *that*. hm. I’d take this graph with a few grains of salt, actually. Although resources like Baf’s Guide and IFDB do mark some games as having mazes, they rarely mark explicitly that a game does not have any mazes. There have also been significant lulls in reporting and cataloging our info. Still, I’m willing to grant the general notion that there’s somewhat less mazes in recent games than those written a decade or so ago. If only dungeon crawls and stat-based combat would do the same. Next I’d like to see the per-year number of I-F blog posts. We’ll just see how the 20th century handles *that*. Hmph! but yeah, I’m glad to see mazes going away too, though not puzzles. Bah. I don’t see “maze” here. Stupid undertagging. I’m confused — those both seem to point to the same place. I figured they were twisty little links, all alike. > mean many different things.